The UN Globally Harmonized System of Classification and Labeling of Chemicals (GHS) is an international system created by the UN to address the classification of chemicals by types of hazard and harmonize hazard communication elements, including labels and safety data sheets. It aims at providing a basis for harmonization of rules and regulations on chemicals at national, regional and worldwide level, an important factor also for trade facilitation. GHS has been introduced to many countries/regions such as Europe, USA, China, Japan and Korea, etc via their own legislation or standards. Hazardous to the Aquatic Environment, Hazardous to the Ozone Layer. After a chemical has been classified, standard hazard statements and codes will be assigned to describe the hazards of a hazardous product and the degree of hazard. 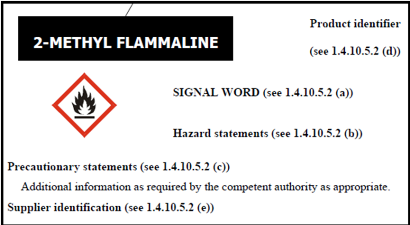 The hazard statements will then be used in Safety Data Sheet and on the label. GHS provides the flexibility to allow countries to adopt the building blocks that they require to meet domestic requirements. There may be differences in categories adopted by different countries. However, the overall information such as label elements (pictograms, signal words, hazard and precautionary statements) are harmonized. Other additional information required by different authorities. In case of small and awkward packaging, some elements may be omitted. For single packaging, transport label and hazard pictogram may appear on the same GHS label; In the event that transport label and GHS hazard pictogram represents the same hazard, GHS hazard pictogram can be omitted. Safety Data Sheet is very important hazard communication document to inform its audience of the hazards of a substance or mixture and provide information on the safe storage, handling and disposal of the substance or a mixture. GHS provides guidance on a SDS shall be prepared. Usually, a SDS needs to be prepared in the official language of a destination country. CIRS a leading provider of comprehensive chemical compliance services for companies doing businesses in/with EU and Asia with a strong focus on chemical compliance.